The Mod Mommy: Fred Boost Booster Seat--The Look of a Phone Book with Better Functionality! When you were younger, chances are, your parents slipped something thick and sturdy underneath you when you were eating in order to boost you up higher to sit at the table. "Back in the day," this was typically a phonebook. Well, it's ba-ack! 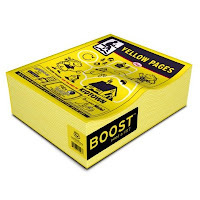 The Fred Boost Booster Seat was created to look like the Yellow Pages, but with a little more functionality. It is shaped a little better for your child's "seat meat" and chances are, will have others asking where you got it--what a clever, funny design for a modern kid's booster seat! Although there is no tray with this, it stands alone and works perfectly for older kids that no longer need a booster seat with a detachable tray, but just need help getting up to the table to enjoy a meal with the family!